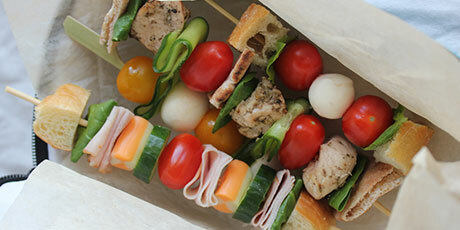 Not your average brown bag lunch, this sandwich-on-a-stick can be fully customized with the ingredients your kids love most. 1. If desired, spread bread with butter, cream cheese or pesto. Cut into 8 pieces. 2. With each skewer, spear bread, meat, cheese, pepper, tomato, cucumber and lettuce, repeating ingredients if desired and ending with a second piece of bread. 3. Tip: When preparing your ingredients, be sure to cut everything into similar-size pieces.